My name is Kari and I was born on 10-23-99. 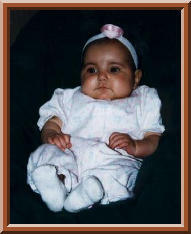 I was 78 days old when my picture above was taken (1-9-00). My papa did the math on that one so blame him if it's wrong. Aren't I beautiful? My papa says I am. I hope I'm as beautiful as my mom and my sisters when I grow up.